To me, there’s something fascinating about old buildings. I don’t know why, but I find cast iron and weathered brick very romantic. When I was a kid, I used to spend afternoons exploring an abandoned WWII army base on the edge of town. Sneaking into the vacant barracks, I tried to imagine how it must’ve been back when the base was in operation and soldiers trained before shipping out overseas. 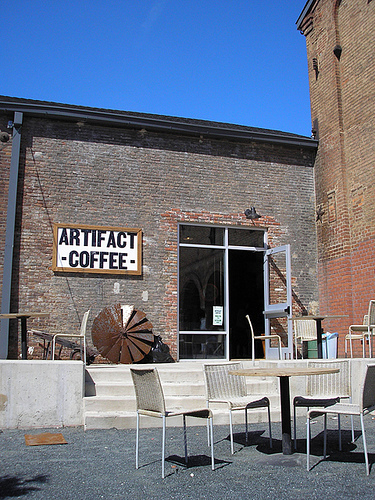 Artifact Coffee is located in Clipper Mill, an urban village built on the site of an abandoned mill that was founded in 1853 and manufactured sails for clipper ships. The wonderful thing about Clipper Mill is that instead of leveling the old buildings, the developers kept the historic facades intact and incorporated them into the design of the modern community. Inside the coffee shop, a state of the art Synesso Cyncra sits juxtaposed against the unvarnished wood counter. Weighing in at almost 175 pounds, the Cyncra is an electronically temperature-controlled, stainless steel work of art. As advanced as is it is though, it is still just a tool (albeit a very nice one) and anything less than a capable hand will produce poor results. Much to their credit, the baristas here have very capable hands. Looking up at the sparse menu, I noticed that I only saw one size of each drink - and no frozen drinks! It’s good to see more owners bucking the “bigger-is-better” venti trend. Single origin french press coffee also figures prominently. I ordered a macchiato and was pleased to see the barista heat up a properly-sized cup with water. Her hands moved confidently and smoothly through the routine undoubtedly polished by thousands of drinks before mine. A minute later, a lovely looking macchiato sat before me on the bar. My tongue wasn’t betrayed by the expectations that my eyes had created. The espresso had the color of mahogany and was buttery, complex, and balanced. It paired perfectly with the subtle sweetness of the microfoamed milk. 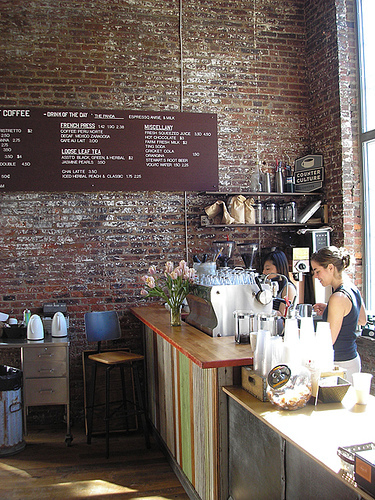 Great coffee, great service, and a beautiful location – what more can one ask for? I really like this place; I just wish that it were closer to my house. Depending upon one’s perspective, the word "Miami" conjures up different images. Many people think of South Beach and its Art Deco architecture and the “beautiful people.” For others, cigars are the main attraction. My thing though, is the coffee window. For the uninitiated, a coffee window is an espresso bar open to the sidewalk. Most Cuban restaurants have them, and they are a local institution. Owing at least in part to the year-round pleasant weather and the fact that Cubans love a good, spirited conversation, at almost any hour you can find a few people socializing outside while enjoying a cafecito. Coffee in Miami is a little (ok, a lot) different than what you may be used to. First of all, there is no brewed coffee. All of it comes from the espresso machine, and it isn’t served up in 20 oz. portions either. The basic drinks are the cafecito, colada, cortadito, and café con leche. Cafecito – espresso with lots of sugar added. Cuban coffee tends to be quite overextracted and the sugar helps offset the bitterness. Colada – a large portion, perhaps 4 oz., served in a small styrofoam cup and accompanied by several small plastic cups. The cups are for you to share your coffee with your friends or workmates. 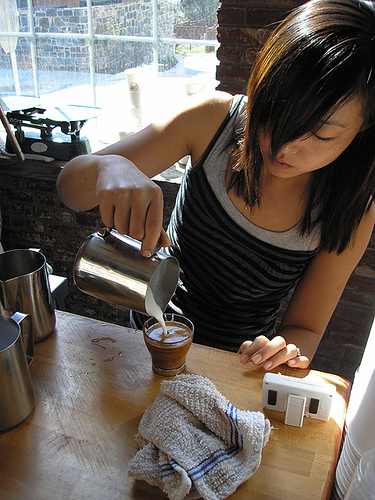 Cortadito – a cafecito with anywhere from a tablespoon of milk to half milk/half coffee. Café con leche – the Cuban equivalent of a latte; usually drunk in the morning. Although I don’t get into Miami as often as I like, I pass through Miami International a few times a year and get to indulge my cafecito jones at La Carreta, a Cuban restaurant located at the entrance to concourse D. There’s no better way to shake out the cobwebs of an 8-hour overnighter than with a cafecito and a couple of ham croquettes!